This Policy sets out the obligations of ELN Limited, a company registered in England & Wales under number 9746917, whose registered office is at 23A Kenilworth Gardens, Hayes UB4 0AY (“the Company”) regarding data protection and the rights of customers (“data subjects”) in respect of their personal data under EU Regulation 2016/679 General Data Protection Regulation (“GDPR”). 2.1 Processed lawfully, fairly, and in a transparent manner in relation to the data subject. 2.2 Collected for specified, explicit, and legitimate purposes and not further processed in a manner that is incompatible with those purposes. Further processing for archiving purposes in the public interest, scientific or historical research purposes or statistical purposes shall not be considered to be incompatible with the initial purposes. 2.3 Adequate, relevant, and limited to what is necessary in relation to the purposes for which it is processed. 2.4 Accurate and, where necessary, kept up to date. Every reasonable step must be taken to ensure that personal data that is inaccurate, having regard to the purposes for which it is processed, is erased, or rectified without delay. 2.5 Kept in a form which permits identification of data subjects for no longer than is necessary for the purposes for which the personal data is processed. Personal data may be stored for longer periods insofar as the personal data will be processed solely for archiving purposes in the public interest, scientific or historical research purposes, or statistical purposes, subject to implementation of the appropriate technical and organisational measures required by the GDPR in order to safeguard the rights and freedoms of the data subject. 2.6 Processed in a manner that ensures appropriate security of the personal data, including protection against unauthorised or unlawful processing and against accidental loss, destruction, or damage, using appropriate technical or organisational measures. 3.1 The right to be informed (Part 12). 3.8 Rights with respect to automated decision-making and profiling (Parts 19 and 20). 4.1.6 The processing is necessary for the purposes of the legitimate interests pursued by the data controller or by a third party, except where such interests are overridden by the fundamental rights and freedoms of the data subject which require protection of personal data, in particular where the data subject is a child. 4.2.10 The processing is necessary for archiving purposes in the public interest, scientific or historical research purposes, or statistical purposes in accordance with Article 89(1) of the GDPR based on EU or EU Member State law which shall be proportionate to the aim pursued, respect the essence of the right to data protection, and provide for suitable and specific measures to safeguard the fundamental rights and the interests of the data subject. 5.1.2 Personal data obtained from third parties e.g. employers and colleagues etc. 5.2 The Company only collects, processes, and holds personal data for the specific purposes set out in Part 21 of this Policy (or for other purposes expressly permitted by the GDPR). 5.3 Data subjects are kept informed at all times of the purpose or purposes for which the Company uses their personal data. Please refer to Part 12 for more information on keeping data subjects informed. 7.1 The Company shall ensure that all personal data collected, processed, and held by it is kept accurate and up-to-date. This includes, but is not limited to, the rectification of personal data at the request of a data subject, as set out in Part 14, below. 7.2 The accuracy of personal data shall be checked when it is collected and at regular intervals thereafter until course completion. After this point the data will be archived as is, to fulfil Joint Awarding Body (JAB) guidelines to retain all customer records for a period of 6 years. If any personal data is found to be inaccurate or out-of-date, all reasonable steps will be taken without delay to amend or erase that data, as appropriate. 8.1 The Company shall not keep personal data for any longer than is necessary in light of the purpose or purposes for which that personal data was originally collected, held, and processed. 8.2 When personal data is no longer required, all reasonable steps will be taken to erase or otherwise dispose of it without delay. 8.3 For full details of the Company’s approach to data retention, including retention periods for specific personal data types held by the Company, please refer to our Data Retention Policy. 10.1 The Company’s Data Protection Officer is Mr Salman Shah, salman@eln.io. 10.2 The Data Protection Officer shall be responsible for overseeing the implementation of this Policy and for monitoring compliance with this Policy, the Company’s other data protection-related policies, and with the GDPR and other applicable data protection legislation. 10.3.6 Detailed descriptions of all technical and organisational measures taken by the Company to ensure the security of personal data. 11.1 The Company shall carry out Data Protection Impact Assessments for any and all new projects and/or new uses of personal data which involve the use of new technologies and the processing involved is likely to result in a high risk to the rights and freedoms of data subjects under the GDPR. 11.2.9 Proposed measures to minimise and handle identified risks. c) as soon as reasonably possible and in any event not more than one month after the personal data is obtained. 12.2.12 Details of any automated decision-making or profiling that will take place using the personal data, including information on how decisions will be made, the significance of those decisions, and any consequences. 13.1 Data subjects may make subject access requests (“SARs”) at any time to find out more about the personal data which the Company holds about them, what it is doing with that personal data, and why. 13.2 Employees wishing to make a SAR should do using a Subject Access Request Form, sending the form to the Company’s Data Protection Officer at salman@eln.io. 13.3 Responses to SARs shall normally be made within one month of receipt, however this may be extended by up to two months if the SAR is complex and/or numerous requests are made. If such additional time is required, the data subject shall be informed. 13.4 All SARs received shall be handled by the Company’s Data Protection Officer. 13.5 The Company does not charge a fee for the handling of normal SARs. The Company reserves the right to charge reasonable fees for additional copies of information that has already been supplied to a data subject, and for requests that are manifestly unfounded or excessive, particularly where such requests are repetitive. 14.1 Data subjects have the right to require the Company to rectify any of their personal data that is inaccurate or incomplete. 14.2 The Company shall rectify the personal data in question, and inform the data subject of that rectification, within one month of the data subject informing the Company of the issue. The period can be extended by up to two months in the case of complex requests. If such additional time is required, the data subject shall be informed. 14.3 In the event that any affected personal data has been disclosed to third parties, those parties shall be informed of any rectification that must be made to that personal data. 15.1.5 The personal data needs to be erased in order for the Company to comply with a particular legal obligation. 15.2 Unless the Company has reasonable grounds to refuse to erase personal data, all requests for erasure shall be complied with, and the data subject informed of the erasure, within one month of receipt of the data subject’s request. The period can be extended by up to two months in the case of complex requests. If such additional time is required, the data subject shall be informed. 15.3 In the event that any personal data that is to be erased in response to a data subject’s request has been disclosed to third parties, those parties shall be informed of the erasure (unless it is impossible or would require disproportionate effort to do so). 16.1 Data subjects may request that the Company ceases processing the personal data it holds about them. If a data subject makes such a request, the Company shall retain only the amount of personal data concerning that data subject (if any) that is necessary to ensure that the personal data in question is not processed further. 16.2 In the event that any affected personal data has been disclosed to third parties, those parties shall be informed of the applicable restrictions on processing it (unless it is impossible or would require disproportionate effort to do so). 17.1 The Company processes personal data using automated means via website checkout systems, payment merchant captured details, Smartsheet portfolio records and LMS track records. 17.2 Where data subjects have given their consent to the Company to process their personal data in such a manner, or the processing is otherwise required for the performance of a contract between the Company and the data subject, data subjects have the right, under the GDPR, to receive a copy of their personal data and to use it for other purposes (namely transmitting it to other data controllers). 17.3.2 All other records exported from our systems into CSV, PDF, Word (or other universally acceptable format) and sent via email. 17.4 Where technically feasible, if requested by a data subject, personal data shall be sent directly to the required data controller. 17.5 All requests for copies of personal data shall be complied with within one month of the data subject’s request. The period can be extended by up to two months in the case of complex or numerous requests. If such additional time is required, the data subject shall be informed. 18.1 Data subjects have the right to object to the Company processing their personal data based on legitimate interests, direct marketing (including profiling), and processing for statistics purposes. 18.2 Where a data subject objects to the Company processing their personal data based on its legitimate interests, the Company shall cease such processing immediately, unless it can be demonstrated that the Company’s legitimate grounds for such processing override the data subject’s interests, rights, and freedoms, or that the processing is necessary for the conduct of legal claims. 18.3 Where a data subject objects to the Company processing their personal data for direct marketing purposes, the Company shall cease such processing immediately. 19.1 The Company uses personal data in automated decision-making processes e.g. automated calculation of study hours, test scores / results and achievement of a qualification which may, or may not, lead to downloadable certification. 19.2 Where such decisions have a legal (or similarly significant effect) on data subjects, those data subjects have the right to challenge to such decisions under the GDPR, requesting human intervention, expressing their own point of view, and obtaining an explanation of the decision from the Company. 19.3.3 The data subject has given their explicit consent. 21.8 All personal data to be transferred physically, whether in hardcopy form or on removable electronic media shall be transferred in a suitable container marked “confidential”. 22.5 No personal data should be transferred to any device personally belonging to an employee and personal data may only be transferred to devices belonging to agents, contractors, or other parties working on behalf of the Company where the party in question has agreed to comply fully with the letter and spirit of this Policy and of the GDPR (which may include demonstrating to the Company that all suitable technical and organisational measures have been taken). 24.5 Where personal data held by the Company is used for marketing purposes, it shall be the responsibility of the Data Protection Officer to ensure that the appropriate consent is obtained and that no data subjects have opted out, whether directly or via a third-party service such as the TPS. 25.4 No software may be installed on any Company-owned computer or device without the prior approval of the named Data Protection Officer. 26.11 Where any agent, contractor or other party working on behalf of the Company handling personal data fails in their obligations under this Policy that party shall indemnify and hold harmless the Company against any costs, liability, damages, loss, claims or proceedings which may arise out of that failure. 27.1 The Company may from time to time transfer (‘transfer’ includes making available remotely) personal data to countries outside of the EEA. 27.2.8 The transfer is made from a register that, under UK or EU law, is intended to provide information to the public and which is open for access by the public in general or otherwise to those who are able to show a legitimate interest in accessing the register. 28.1 All personal data breaches must be reported immediately to the Company’s Data Protection Officer. 28.2 If a personal data breach occurs and that breach is likely to result in a risk to the rights and freedoms of data subjects (e.g. financial loss, breach of confidentiality, discrimination, reputational damage, or other significant social or economic damage), the Data Protection Officer must ensure that the Information Commissioner’s Office is informed of the breach without delay, and in any event, within 72 hours after having become aware of it. 28.3 In the event that a personal data breach is likely to result in a high risk (that is, a higher risk than that described under Part 29.2) to the rights and freedoms of data subjects, the Data Protection Officer must ensure that all affected data subjects are informed of the breach directly and without undue delay. 28.4.5 Details of the measures taken, or proposed to be taken, by the Company to address the breach including, where appropriate, measures to mitigate its possible adverse effects. This Policy shall be deemed effective as of 25th May 2018. No part of this Policy shall have retroactive effect and shall thus apply only to matters occurring on or after this date. An Appeal is a procedure that allows a candidate to formally challenge the decision of the Examiners on specified grounds for Internally Marked Assessments (see grounds for an appeal below). For Externally Marked Assessments, the learner may appeal to The e-Learning Network (ELN) regarding their result and we will do our best to facilitate the appeals procedure for the relevant awarding body (see section 1.4). The procedure for making an appeal is summarized below: - Please note all Appeals must be made in writing by email or post. That there is evidence of prejudice, bias, or inadequate assessment on the part of one or more examiners. It is important to note that a candidate cannot appeal simply because he/she feels that they deserve a better result. Candidates cannot appeal solely because the result is worse than they would have wished or worse than they feel they deserve. No appeal will be allowed on the grounds that, although the decision of the examiners was properly made, candidates believe that the Examiner may have erred in his/her judgment of the results achieved. The procedures for appeals for internal assessment have two phases. Full name, date and location of course and examination. Reasons / grounds for appeal. Evidence for the appeal in the form of documents (copies of learning logs, test papers etc) along with date(s) and time(s) of occurrences relevant. The ELN Assessor will normally aim to respond to a student’s request for internal resolution within a maximum period of 10 days. Stage Two If the candidate is unable to come to an agreement with his/her Assessor then they can escalate the appeal to the IQA/Quality Nominee for consideration. The escalated appeal must be submitted within 14 days of notification of a failure to resolve the dispute with the Assessor. Only once the above internal process has been exhausted can the Appeal be escalated to the Managing Director. Where the MD has already been involved in the assessment/appeals process, ELN will arrange an independent qualified and competent person or company to mediate. Failure to resolve the dispute internally may ultimately result in the dispute being escalated to the Awarding Body, whose decision will be deemed final. All evidence of appeal, decisions and disputes will be provided to the Awarding Body at this stage. The Awarding Body will deal with all appeals relating to an external assessment. Most importantly, this Appeal will only be made by the Centre on behalf of individual candidates and not by the candidates themselves. The Centre will send any evidence and the candidate’s appeal to the Awarding Body. Evidence sent will usually be the candidate’s actual exam paper (if this has not already been sent to the Awarding Body) and an application stating the basis of the appeal. It is outside the remit of ELN to control the outcomes or time taken for resolving Appeals by any Awarding Bodies, however, we will do our best to facilitate the process for both candidate and Awarding Body. The candidate must never contact the Awarding Body directly unless expressly requested by the Awarding Body to do so. The consumer has from the day of their purchase 14 days to cancel their course and be eligible for a full refund of 100% of the purchase order providing they have not accessed / logged into their course(s). The trainer/tutor/assessor of the course should be alerted at the earliest opportunity. Our employees are trained to deal with certain problems and will rectify any problems or seek further guidance as soon as it is drawn to their attention. Should you be dissatisfied with the outcome at this stage OR if the complaint is about that particular member of staff you should follow proceed with the following steps. ELN contact details are found on all course materials, website, stationery, banners and the introduction at the beginning of each course. You have the right to contact the company and speak to Customer Services (02033717309) if you feel dissatisfied. You also have the right to submit a complaint by either email to info@eln.io or in writing to ELN 3 Copper Ridge, Gerrards Cross, Bucks SL9 0NF. Full name, date and location of course attended. Any supporting evidence in the form of documents or date(s) and time(s) of occurrences. Your desired outcome or resolution of the complaint. Full details of where the reply should be sent too. All complaints will be acknowledged by the relevant means as soon as they have been received. ELN shall then conduct a full internal investigation impartially and thoroughly. A written report will be made after the investigation on its findings and any remedial action. This shall be sent to you within 10 days of your complaint being received. Escalation of the complaint will follow the route outlined as: Trainer/Assessor –> Customer Services/ Admin –> IQA / Quality Nominee –> Independent third party (hired by ELN) –> Awarding Body. b. The complaint is regarding something that is not relevant to the awarding body (e.g. no refreshments provided during the course). These details are made available from our office staff and course trainer. All complaints are held on file to assist staff training and future appraisals. The e-Learning Network will treat all employees with dignity and respect and will provide an environment for learning and working that is free from unlawful discrimination, harassment, bullying and victimisation. ELN is committed to an Equal Opportunities Policy and recognises the importance and value of Diversity. We recognise our social, moral and statutory duty to admit and employ people with disabilities, and will do all that is practicable to meet this requirement responsibility. ELN wishes to be an organisation that is recognised by the community for good employment and learner opportunities. We want individuals who apply to ELN to be confident that they will receive fair treatment and be considered on their ability to do the job. ELN's employment policies aim to ensure that people with disabilities receive treatment that is fair, equitable and consistent with their skills and abilities. Similarly, we admit students to the available places on its courses based on their academic ability and motivation, whilst recognising the particular achievements of disabled students who have reached this stage. ELN will make every effort, if an existing employee becomes disabled, to re-train and retain them wherever practicable. ELN is committed to providing relevant training on disability and involves disabled people and interested parties via the Disability Action Committee, in policy implementation and evaluation. Disability is one of the protected characteristics under the Equality Act 2010. From 1 October 2010, the Equality Act replaced most of the Disability Discrimination Act (DDA). However, the Disability Equality Duty in the DDA continues to apply. The Disability Equality Duty marks a commitment towards actively promoting equality of opportunity for disabled people. The Equality Act 2010 was introduced to harmonise and replace previous legislation, such as the Disability Discrimination Act 2005. The Equality Act has strengthened particular aspects of equality law, and in particular, disabilities. For instance, new categories of discrimination have been introduced, see section 1.4 below. The Equality Act has made it easier for a person to show that they are disabled and be protected from discrimination. The Act puts a duty on ELN to make reasonable adjustments for staff to help them overcome disadvantage resulting from an impairment, e.g. by providing assistive technologies to help visually impaired staff use computers effectively. The Equality Act takes the approach that employers and service providers must look specifically at the particular person's disability and indentify how, if practicable, they can ensure that the disabled person is treated as favourably as everybody else. The law is in place to promote equal rights and fair treatment for all. UK Training Hub Ltd complies with this legislative definition. Direct Discrimination: An individual is treated less favourably than another because of a disability. Indirect Discrimination: When a rule or policy applies to the majority but disadvantages someone with a protected characteristic (disability). Discrimination by Association: Direct discrimination against someone because they associate with another person who has a disability. Discrimination by Perception: Direct discrimination against an individual because the others think they possess a particular protected characteristic, e.g. disability. Harassment: Many people with disabilities experience harassment at work. At ELN harassment will not be tolerated and every reasonable step will be taken to deal with it. Any refusal to work with people because of their disability is unacceptable and will not be tolerated. Staff can complain of behaviour they find offensive even if it is not directed at them, for example, if they believe the harassment or treatment of another has created a hostile environment. Harassment by a Third Party: ELN is potentially liable for harassment of our staff by people we don't employ, e.g. out-sourced contractors. o by failing to make a ‘reasonable adjustment' compared with other people for a reason relating to their disability. the support of fellow workers / students can be enlisted. The applicant or employee will always be informed about the purposes for which the personal information will be used. The Equality Act makes it unlawful, except in certain circumstances, for employers to ask about a candidate's health before offering them work. Health questionnaires filled out by job applicants are sent to Occupational Health in confidence and are not used to screen prospective employees. Every individual working within ELN has responsibilities under the Equality Act 2010, although all those in executive and / or managerial positions have a particular responsibility to ensure implementation of the College's Equal Opportunity policies and procedures. The College has a responsibility to avoid discrimination in the areas of recruitment, training and development, career development, redundancy and dismissal, day to day working life Everyone working for ELN, and those responsible for procuring services for ELN, are responsible for ensuring that non-discriminatory policies and procedures are in place in order to avoid discrimination against disabled staff, students, clients and visitors. In addition, all staff have a responsibility to avoid, and to challenge the victimisation or harassment of disabled people. If any member of staff believes they have been treated in a way that is contrary to this policy, concerns should be raised with someone in authority who is in a position to take appropriate action, e.g. a senior manager in the department, the Principal, the academic Registrar, the HR Manager or Director. ELN is committed to conducting transparent monitoring to make ELN fully accessible for all. The Disability and Equal Opportunities Policies are published on the website, student and staff handbooks. These are reviewed regularly to ensure they are kept up to date and in line with current legislation. Website the website that you are currently using, www.eln.io, and any sub-domains of this site unless expressly excluded by their own terms and conditions. 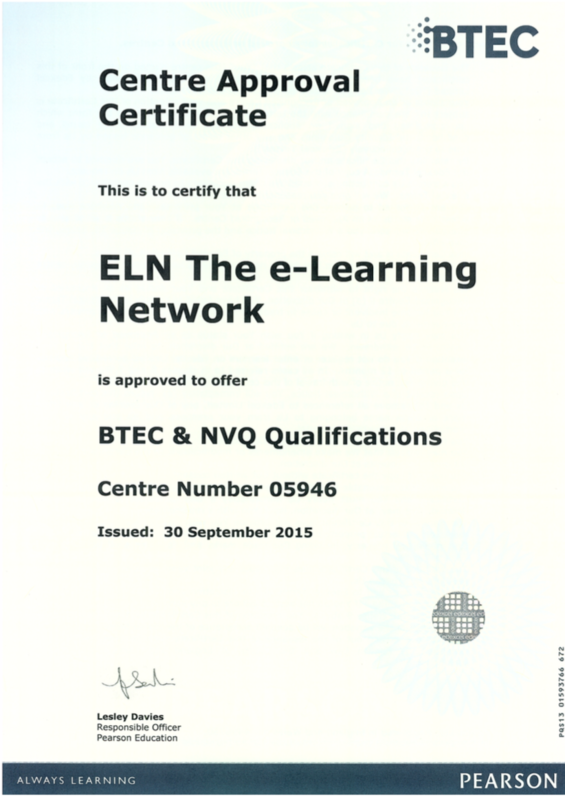 For purposes of the Data Protection Act 1998, ELN The e-Learning Network is the "data controller". ELN The e-Learning Network may, from time to time, employ the services of other parties for dealing with certain processes necessary for the operation of the Website. The providers of such services have access to certain personal Data provided by Users of this Website. You have the right to ask for a copy of any of your personal Data held by ELN The e-Learning Network (where such Data is held) on payment of a small fee, which will not exceed £25. Data security is of great importance to ELN The e-Learning Network and to protect your Data we have put in place suitable physical, electronic and managerial procedures to safeguard and secure Data collected via this Website. Before the Website places Cookies on your computer, you will be presented with a message bar requesting your consent to set those Cookies. By giving your consent to the placing of Cookies, you are enabling ELN The e-Learning Network to provide a better experience and service to you. You may, if you wish, deny consent to the placing of Cookies; however certain features of the Website may not function fully or as intended. Type of CookiePurposeStrictly necessary cookiesThese are cookies that are required for the operation of our website. They include, for example, cookies that enable you to log into secure areas of our website, use a shopping cart or make use of e-billing services.Analytical/performance cookiesThey allow us to recognise and count the number of visitors and to see how visitors move around our website when they are using it. This helps us to improve the way our website works, for example, by ensuring that users are finding what they are looking for easily.Functionality cookiesThese are used to recognise you when you return to our website. This enables us to personalise our content for you, greet you by name and remember your preferences (for example, your choice of language or region). You may contact ELN The e-Learning Network by email at info@eln.io. The e-Learning Network (ELN) is committed to leading the industry in minimising the impact of its activities on the environment. Our aim is to be carbon neutral in all our operations. Minimise toxic emissions through the selection and use of its fleet and the source of its power requirement. This includes hiring local invigilators and trainers across the UK, minimising the amount of travel required and encouraging use of public transport by staff and candidates. Incorporate and encourage use of technological advancements wherever practicable to reduce paper and other wastage. Use an accredited program to offset the greenhouse gas emissions generated by our activities. Wherever practically possible, we implement eco-friendly practice. This includes recycling our waste and use of materials that are from renewable or sustainable resources. The e-Learning Network (ELN) is committed to providing equal opportunities for candidates, applicants for employment and employees. We are committed to creating an inclusive environment which values diversity and is free from harassment, victimisation, discrimination and bullying. We aim to provide an inclusive environment which values diversity and maintain a working, learning and social environment in which the rights and dignity of all its staff and candidates are respected to assist them in reaching their full potential. We assess each individual on their ability and do not make judgments based on age, gender, marital status, colour, disability, ethnic or national origin, religious or sexual orientation. To understand and comply with the policy. To make sure that the employees or candidates’ own behaviour and language do not cause misunderstanding or offence. To inform Head Office immediately if any employee or candidate experiences any form of discrimination, bullying or harassment, so that they can provide impartial and confidential advice and support. Base our decisions on merit and ability in all aspects of study, employment, recruitment, promotion, training etc. Vary our marketing strategies and outreach media in order to attract applications from all genders, races, areas, abilities and backgrounds. Regard all staff as potentially suitable for all vacancies, including management positions, regardless of background. Not discriminate when we carry out performance reviews. Give all staff the same training opportunities. Ensure all training materials are unbiased and the Training Department will do all they can to accommodate special needs. Ensure all marketing materials are unbiased and are distributed in as diverse ways as possible. Provide innovative and flexible working arrangements to meet the needs of our employees, trainees and corporate clients. View harassment as unacceptable and will investigate incidents fully. Make this policy available to all staff and candidates for training. Wherever possible, we will strive to provide reasonable adjustments to allow equal access to assessment and training for all candidates. These will be dealt with on a case-by-case basis as each individual is different. The Special Considerations / Reasonable Adjustments / equivalent policy of the relevant Awarding Organisation. Degree of assistance / adjustments required e.g. if the special considerations can be fulfilled internally or we may be required to hire a specialist which may take more time. Permission(s) granted by the Awarding Organisation or any other regulatory authority in general or in particular to the case at hand. Other time/resource restrictions, which may cause delays in provision outside of our control. In order to establish all The e-Learning Network (ELN) policies and to monitor the standards that the Company has set as part of the provision of its services, it has been necessary to develop a systematic approach to Quality Management, aiming at providing the best service that our customers require. Training provision of all our employees is the key to fulfilling our objectives as we can target the achievement of dual goals, in the form of quality service for our candidates via highly skilled and knowledgeable employees. We commit ourselves to reviewing these arrangements and systems on a regular basis as part of the Quality Assurance System that we have put in place. It is the policy of ELN to ensure that all of its employees are fully aware of the contents of this document and that they demonstrate at all times their ability and willingness to carry out its instructions so as to provide all customers of ELN with a quality service that ELN provides as part of this policy. We will continuously strive to provide quality service to all our customers by implementing all parts of the Quality Assurance System. We will work proactively to continuously improve the quality of our services (Training, Customer Services, Post-course Services) in order to ensure that we continue to provide our customers with up-to-date and relevant information as part of our commitment to quality. We will stringently review and improve our internal policies and processes on an ongoing basis as part of our commitment to ensure and maintain the best level of services and IAG (Information, Advice and Guidance) to our customers and staff. We understand that our services have value only if they contribute and are relevant to the on-going development of our candidates’ learning. We aim to monitor our customers’ ever changing needs as the industry evolves and new trends, standards and markets may require them to have access to new learning and development. We are registered with the ICO and will always abide by the regulatory requirements of the Data Protection Act in the creation, maintenance, storage, access and deletion or disposal of any sensitive information held by us. The Quality Verifier is responsible for reviewing the quality of Training, Assessment and Internal Verification decisions during and at the end of the Training process. Quality verification will take place by an appointed person, usually the Quality Verifier, however, other people may be involved in this process from time to time. This may include the Training Manager, an IV, or an impartial, External Quality Verifier, hired by ELN or AO. Internal verification is at the centre of Quality Assurance of all Training programs. The role of Quality Verification in managing training assessment and internal verification is that it consistently meets the criteria of the National Occupational Standards. The Quality Verifier is therefore the key factor in managing risk – ensuring that when a certificate is claimed for a candidate, it marks the achievement of the standards. To review the quality of the Training Assessment and Internal Verification decisions during and at the end of the verification process. Periodic Sampling enables the Quality Verifier to be involved with the training, assessment and verification process at different stages including registration and post-course service and advice. This involves reviewing the work undertaken by the sales staff, trainer, trainee and admin staff prior to decisions being made on certification i.e. during the course. It will involve the reviews given by Trainers to trainees and those given by the Internal Verifier to Trainers. This will enable the Quality Verifier to evaluate the quality of guidance on training, assessment and internal verifications and the effectiveness of planning assessments. By performing periodic sampling this will allow the Quality Verifier in identifying problems at an early stage so avoiding the need to turn down assessment and verification decisions, identify good practice and training, and maintain standardisation with all members of the Training team. Valid – relevant to the standards for which competence is claimed. Authentic – the trainee’s own work / been produced by the trainee. Current – sufficiently recent to be confident that the same level of skill, understanding and knowledge exist at the time of claim. Timely – the work has been completed and submitted within the specified timeframes allowed by the Awarding Body. Sufficient – meets ALL the requirements of the standards in full. Role of sales and admin staff in storage, processing and shipping of important paperwork and documents. Must have experience and will be trained in house regarding ethical sales, customer services and any other relevant training as required as per their PDP or TNA. Register candidates for the program. Give accurate, informed and reliable Information, Advice and Guidance (IAG) at the time of booking. Turn away candidates not suitable for the qualifications in line with Awarding Body regulations. Ensure all sensitive personal data is kept confidential and stored according to Data Protection legislation. Identify and inform the relevant Trainer, the Training Manager and Office Manager of any candidates requiring additional help for the course and / or exam, where allowed by the Awarding Body. Must have experience and will be trained in house regarding effective time management and project management, customer services and any other relevant training as required as per their PDP or TNA. Mail candidates the information pack upon registration where email confirmation does not suffice or where details are requested by post specifically, by the candidate. Ensure all sensitive personal documents and details are held according to Data Protection legislation. Ensure all ELN and Awarding Body documentation, especially Exam Papers, are held securely in the premises, during shipment and processing. Accurate counts must be kept of all Assessment Papers received from Awarding Body, stored, shipped to Training, received back for processing, forwarded to Awarding Body for checking (where applicable). Assessment Papers can include exam papers or portfolio assessments. Ensure the correct arrangements have been made for any additional help or special needs of candidates identified by the Sales Staff. Ensure all audio / video /electronic assessments are stored and organised securely and backups made. Update candidate results and post certificates in a regular, timely manner while maintaining clear records. Ensure any malpractice concerns or accidents are reported to the line manager, QV or MD immediately. If required, assessor must hold the Level 3 Assessor qualification or acceptable equivalent. At registration, verify and re-check info provided by Sales staff including, ID documents, candidate name spellings, date of birth, contact details, payment details, special needs and suitability for completing the course. Report correct numbers of students, resits, payments to the Training Manager and Accountant where relevant. Carry out assessments and provide verbal / written feedback (depending on the program being delivered). Ensure the correct number of Contact Hours have been met in line with ELN and Awarding Body policy on Guided Learning Hours (GLH) for that course. Deliver the training according to the Lesson Plans provided / approved by ELN and the Awarding Body with the best knowledge, integrity and respect for all. Complete all documents and paperwork in line with ELN and Awarding Body’s policies and procedures. Ensure any malpractice concerns or accidents are reported to the Training Manager, QV or MD immediately. Must sample across all trainers/assessors and all training programs..
Be involved in the recruitment and training of Trainers and Assessors..
Must be V1 / D34 / Level 4 IQA qualified with occupational competence and experience of teaching in the relevant subject.. Provide induction to all new trainers and assessors to ensure that they have a full understanding of process and have all the correct documentation to carry out training and assessment. Monitor development of Trainers and Assessors.. Ensure that Trainers and Assessors are using and have access to all the tools necessary to carry out their role..
Make checks on the registration and enrolment of trainees with awarding body (where necessary). Hold team meetings and standardisation meetings, carry out observations of trainers and assessors, sample portfolios of evidence (where applicable), interview candidates from the courses.. Create action plans for improved performance activities.. Complete and maintain all relevant records.. Provide feedback to the Quality Verifier and Management.. Attend meetings with Awarding Bodies and provide feedback to the Training and Assessment team..
Make claim for Trainees’ certificates once all requirements have been satisfied. Must be V1 / D34 / Lead IQA qualified with occupational competence and experience of managing, assessing and teaching in the relevant subject(s). Provide training and support to the Internal Verifier. Assist in the appointment of Trainers, Assessors and Internal Verifiers. Sample the practices of the Admin and Sales staff, the Internal Verifier and Trainer/Assessors. Train admin and sales staff to ensure Awarding Body requirements are being met at all stages of registration, training and certification. Hold and attend the Standardisation and team meetings. Provide feedback to the Assessment team and Top Management on updates received from all levels of staff and candidates. Attend meetings with Awarding Body personnel during approval and sampling visits. Attend relevant Awarding Body trainings and workshops and ensure that up-to-date and accurate information and documents are forwarded and explained to relevant departments and Management. Deal with any potential or reported cases of malpractice or accidents with view to maintaining integrity and security of data and documents at all times. This may include liaising with internal Management and Awarding Body members. The Quality Verifier has the authority to monitor the performance of internal verifiers, trainers/assessors and admin/sales staff as well as sampling candidates’ portfolios (where applicable), observing candidates whilst undergoing training and interviewing them. Methods used by the internal verifier for sampling portfolios and monitoring the performance of assessors must be clearly auditable. The evidence sampled must contain the internal verifier’s initials/signature and the date the evidence was sampled. If the evidence sampled is satisfactory then the evidence can be signed and dated. If the evidence is not satisfactory then the IV must put a date beside the evidence. Depending on the severity of the case, certification must be blocked until the situation has been resolved. A sampling report with suggestions for future improvements must to be completed with a note of the evidence sampled. Sampling report must be sent to the relevant trainer, Training Manager and MD. When the internal verifier is satisfied that the Trainee is competent and certificate can be claimed, an IV report should be completed and sent to the Quality Verifier. Declarations of authenticity from candidate, trainer, IV and / or QV must be signed and maintained as well as a clear audit trail of records from each stage. The Quality Verifier is responsible for ensuring that all internal verifiers, trainers and assessors maintain their occupational and professional competence. All significant changes/amendments to pre-approved courses (by external Awarding Bodies) will be notified to those Awarding Bodies and where applicable approval will be sought before changes take place. As part of our stringent IQA measures ELN forbids any trainer / assessor / invigilator to train/assess/invigilate any person(s) who are related to them, or any person(s) in whose results the employee may have a vested interest. It is the responsibility of the Lead IV to ensure that allocations are made in a way to ensure this does not happen. In instances where such activities may have happened, this will be deemed as failure to inform ELN of the conflict of interest and the Training Director will internally investigate the incident in question. The investigation should be conducted within 5 days of the reported incident so that appropriate measures can be taken on time. The ELN employee involved will have to supply written information on why this potential conflict of interest was not disclosed previously. All results from the investigation will be shared with the relevant Awarding Body and the mutually agreed decision (between the Awarding Body and ELN) for resolution will be final. The final decision will be given to the relevant employee in writing no later than 5 working days from date of agreement of the resolution. All ELN employees are made aware of this policy within their employment contracts. At The e-Learning Network (ELN), we seek to provide learners with guidance and support to help them achieve their learning and development goals while meeting all regulatory requirements. This policy applies to all qualifications offered by ELN, including those on the Qualifications and Credit Framework (QCF). 1.1 What is ‘Recognition of Prior Learning’ (RPL)? ‘Recognition of Prior Learning’ (RPL) is defined by Ofqual as “a method of assessment [leading to the award of credit] that considers whether learners can demonstrate that they can meet the assessment requirements for a unit through knowledge, understanding or skills they already possess and so not need to develop through a course of learning.” Regulatory arrangements for the Qualifications and Credit Framework (Ofqual/08/3726) RPL can be used where a learner has not had their prior learning formally recognised. If a learner has certificated learning, then they should apply for exemption, not RPL. In the QCF, RPL refers particularly to previously uncertificated learning, and achievements through RPL always lead to the award of credit. ELN acknowledge that one of the principles key to ‘claiming credit’ in the QCF is that individuals should not be required to repeat things that they have already learnt. This principle not only relates to RPL but also to two related but different processes: exemption and credit transfer. 1.2 What do ‘Exemption’ and ‘Credit Transfer’ mean? Exemption is the facility for a learner to claim exemption from some of the achievement requirements of a qualification, using evidence of certificated achievement deemed to be of equivalent value. Within the Regulatory arrangements for the Qualifications and Credit Framework, ‘exemption’ is defined as “the facility for a learner to claim exemption from some of the achievement requirements of a QCF qualification, using evidence of certificated, non-QCF achievement deemed to be of equivalent value.” (page 40) This definition of ‘exemption’ makes clear that the process relates exclusively to certificated learning outside the QCF. Within the QCF the principle of not repeating things already learnt involves the process of ‘credit transfer’. To summarise, in the QCF, RPL relates to the recognition and qualification process for unqualified skills, knowledge and/or experience. Exemption refers to the process of gaining exemption from certain credit(s) due to previously gained qualifications outside the QCF. Finally, Credit Transfer refers to the process of gaining credit(s) through qualifications already achieved within the QCF. All three, are processes which help the learner utilise their previous qualifications, skills and experiential learning to work towards a new qualification they are hoping to achieve, thus avoiding the need to repeat things already learnt. At ELN we wish to offer all students the opportunity to achieve RPL whenever the qualification and awarding body regulations allow. Learners are registered as soon as they formally start to gather evidence. Records of assessment are maintained, as for any other unit/qualification. Certification and claims are made according to normal procedures. All relevant evidence is assessed before assessment decisions are confirmed. There are designated personnel with the appropriate expertise to support and assure the RPL process. Liaise with the candidate to devise assessment plan(s) to help them work towards gathering the necessary evidence and documentation to achieve the learning outcomes and assessment criteria for the unit(s) to be claimed via RPL. 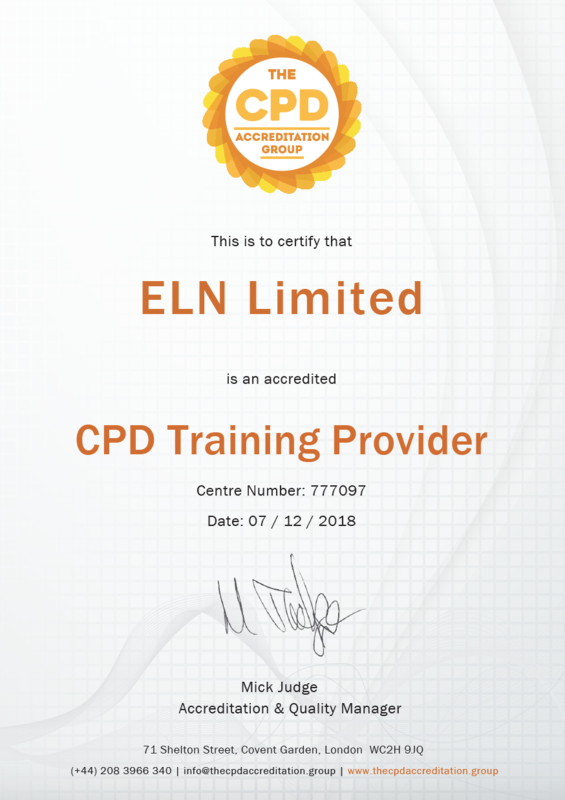 While ELN are dedicated to making the RPL process as widely accessible and practicable as possible there may be circumstances where it may not be possible for us to offer RPL as a method of achieving credit(s) for a qualification. A condition of admission to a regulated profession. Where a unit requires that assessment take place in a given setting and/or at a given time. Any instance where a regulatory authority or relevant awarding body does not allow and/or facilitate the RPL process. The individual is central to the RPL process; it will ultimately be their choice and responsibility to decide whether to claim credit in the QCF through an RPL route. All qualifications in the QCF are achieved through a process of credit accumulation. Individuals who wish to achieve a qualification must accumulate these credits according to designated rules of combination. Advise their tutor or ELN staff at the earliest possible opportunity that they wish to achieve RPL for any credit(s) of a qualification. Demonstrate that they are able to meet the standard of the unit, defined by the learning outcomes and assessment criteria. Understand that ALL the learning outcomes of a unit must be achieved for credit(s) to be awarded, and the number of credits will always be defined by the credit value of the unit. Accept that there is no facility to claim or to be awarded some of the credits in a unit. Carry out the process of collecting evidence against the requirements of the unit(s) through which credit is claimed. In some cases this may involve working out an assessment plan with the tutor. Once the candidate has gathered the relevant evidence to achieve any credit(s) via RPL, their assessor will give feedback to the candidate, discuss the results and give support and guidance on the options available to the candidate, which may include, further learning and development. At this stage, the assessor will also confirm to the individual whether or not a recommendation for the award of credits will be made. If the RPL evidence and assessment has been sufficient, the tutor/assessor will ensure that the relevant unit(s) are claimed as usual. If the RPL evidence and assessment has been insufficient, the tutor/assessor will advice and guide the candidate to the best possible solution i.e. further evidence required, formal learning process, further learning and development etc. If the candidate is not happy with the assessor / tutor’s final decision, they have a right to appeal the decision informally and then formally, according to ELN’s usual Appeals Policy. An excellent advantage of the QCF qualifications to candidates is the process of ‘Credit Transfers’ and ELN will endeavour to help individuals to take advantage of the ‘Credit Transfer’ process to achieve further qualifications in their industry. All qualifications and credit(s) achieved by an individual are registered correctly with the relevant awarding bodies. Candidates are made aware of the advantages of these processes for example, saving time, energy and costs while gaining credit(s) for skills and learning they already have. We work closely with the relevant awarding body for claiming either ‘Exemption’ or ‘Credit Transfer’ for the candidate. All assessment records, previous certification evidence and other records are maintained in a thorough and transparent manner. All relevant records are available for inspection by the awarding body when requested for External Verification. All the usual stringent Quality Assurance, Internal Verification and Assessment guidelines and procedures are applied to these processes, as equal to any other regular examinations or assessments. Our database and electronic systems have been upgraded and updated to provide the flexibility required when dealing with booking and providing results and certification for individual unit(s) and whole qualifications. In turn the candidates are asked to provide timely, authentic and original certificated evidence of previous qualifications relevant to the unit(s) for which they are applying to be exempted or have credits transferred. Ensure that the papers are secure while not in use. Third parties must not have access to these papers. Ensure candidates with special needs are given full support while remaining within awarding body guidelines which will be made available whenever required. Liaise with the Training or Centre Manager regarding this prior to the date of the examination. All written and multiple-choice papers must be completed under examination conditions. Ensure candidates switch off mobile telephones, electronic organisers and computers. Walkman, iPods and similar devices are also to be switched off and secured. All written and multiple choice papers are "closed book" i.e. no books, notes, study aids or publications to be visible or accessible to the candidates unless expressly stated otherwise on the exam paper itself or associated AO guidelines. All candidates must have a clear view of the clock which the invigilator should ensure is showing correct time. Announce the start and finish times of the examination and write these clearly so they are visible to all candidates. Examinations interrupted by fire evacuation, power cuts or other emergency must be aborted. Report any incidents to the Training or Centre Manager as soon as possible, who will arrange a reschedule with the awarding body. Allegations of irregularities and suspected malpractice must be reported to the Training or Centre Manager as soon as possible. A record of this must also be made on the Invigilator reports and the candidate’s examination paper (if applicable). Arrive for your examination 30 minutes before the start time. Bring with you photo identity, eg identity card, passport or driving licence. You cannot sit the examination if you do not have this identity. Only use additional material specified for the examination. Where dictionaries are permitted, you must only use a standard language dictionary. You must not use an electronic dictionary. Do not share question papers or authorised material with other candidates. Do not bring or use any unauthorised material, books or notes in the examination. Do not bring a mobile phone into the examination room. Fill in your full name, candidate number and centre details on the answer book cover before starting the examination. Write clearly in BLOCK CAPITALS. Write your answers in blue or black pen. Pencils should only be used for marking multiple-choice test forms and for graphs, charts or diagrams etc. Do not use correcting pens, fluid or tape in your answers unless permitted by the syllabus. Do not eat or smoke although you may bring in water in a clear bottle with the label removed. Do not communicate with, or seek assistance from, any other candidate while in the examination room. Do not share any material, calculators or dictionaries with other candidates. In an emergency, you may temporarily leave the examination room and be readmitted, although you must be accompanied throughout by a person authorised by the invigilator. You may only leave the examination room once the examination has been in progress for at least 30 minutes. At the end of the examination, check you have added your candidate details to the front of your script. Remain seated until your answers and the question paper have been collected. You must not take the question paper out of the examination room. If you break these regulations you may be disqualified from this and other examinations. If you have any problems with your computer, you must put up your hand (online tests only). The current Awarding Body ID checklist (available from Training Manager who will ensure that the most updated version is being used at all times) must be displayed on examination day in each classroom where an examination is taking place. All candidates must fulfill complete ID requirements as per the Awarding Body ID Checklist. No exceptions allowed unless the candidate can provide written consent from the Awarding Body in advance of the examination. These terms and conditions apply between you, the User of this Website (including any sub-domains, unless expressly excluded by their own terms and conditions), and ELN Limited, the owner and operator of this Website. Please read these terms and conditions carefully, as they affect your legal rights. Your agreement to comply with and be bound by these terms and conditions is deemed to occur upon your first use of the Website. If you do not agree to be bound by these terms and conditions, you should stop using the Website immediately. In these terms and conditions, User or Users means any third party that accesses the Website and is not either (i) employed by ELN Limited and acting in the course of their employment or (ii) engaged as a consultant or otherwise providing services to ELN Limited and accessing the Website in connection with the provision of such services. You must be at least 18 years of age to use this Website. By using the Website and agreeing to these terms and conditions, you represent and warrant that you are at least 18 years of age. You must not otherwise reproduce, modify, copy, distribute or use for commercial purposes any Content without the written permission of ELN Limited. You acknowledge that you are responsible for any Content you may submit via the Website, including the legality, reliability, appropriateness, originality and copyright of any such Content. You may not upload to, distribute or otherwise publish through the Website any Content that (i) is confidential, proprietary, false, fraudulent, libellous, defamatory, obscene, threatening, invasive of privacy or publicity rights, infringing on intellectual property rights, abusive, illegal or otherwise objectionable; (ii) may constitute or encourage a criminal offence, violate the rights of any party or otherwise give rise to liability or violate any law; or (iii) may contain software viruses, political campaigning, chain letters, mass mailings, or any form of "spam." You may not use a false email address or other identifying information, impersonate any person or entity or otherwise mislead as to the origin of any content. You may not upload commercial content onto the Website. You represent and warrant that you own or otherwise control all the rights to the Content you post; that the Content is accurate; that use of the Content you supply does not violate any provision of these terms and conditions and will not cause injury to any person; and that you will indemnify ELN Limited for all claims resulting from Content you supply. This Website may contain links to other sites. Unless expressly stated, these sites are not under the control of ELN Limited or that of our affiliates. Any online facilities, tools, services or information that ELN Limited makes available through the Website (the Service) is provided "as is" and on an "as available" basis. We give no warranty that the Service will be free of defects and/or faults. To the maximum extent permitted by the law, we provide no warranties (express or implied) of fitness for a particular purpose, accuracy of information, compatibility and satisfactory quality. ELN Limited is under no obligation to update information on the Website. Whilst ELN Limited uses reasonable endeavours to ensure that the Website is secure and free of errors, viruses and other malware, we give no warranty or guaranty in that regard and all Users take responsibility for their own security, that of their personal details and their computers. ELN Limited accepts no liability for any disruption or non-availability of the Website. ELN Limited reserves the right to alter, suspend or discontinue any part (or the whole of) the Website including, but not limited to, any products and/or services available. These terms and conditions shall continue to apply to any modified version of the Website unless it is expressly stated otherwise. These terms and conditions will be governed by and interpreted according to English law. All disputes arising under these terms and conditions will be subject to the exclusive jurisdiction of the English courts. Cookies make it easy for you to use our tools, and they help us show you the content most relevant to you. You can choose whether to accept cookies by changing the settings on your browser. However, like most websites, the Change.org platform just doesn’t run properly without cookies. So if you choose to disable cookies, you should know that large parts of the website won’t work. Below we list the different types of cookies that may be used by Change.org. Essential Cookies. Essential cookies enable you to navigate our platform and to use our services and features. Without these cookies, our website and platform will not perform as smoothly for you as we would like, and we may not be able to provide certain core functions and features of our platform. This cookie is used to identify unique users and for authorisation purposes. It expires within eight hours. This cookie is used to identify unique users and for authorisation purposes. It expires within thirty days. This session cookie is used for re-login assistance after expiration of your session. This session cookie is used to enable users to view pre-release features on our platform. Social Media Cookies. Social media cookies collect information about social media usage. If you’ve signed in on Change.org through Facebook connect, you are likely cookied by Facebook. You can modify or change those cookies through the settings on your Facebook account. These cookies are set by Facebook for application integration and expires within one year. See here for more information on Facebook’s practices at https://www.facebook.com/help/cookies/. Analytics Cookies. Analytics cookies collect information about your use of the Change.org platform, and enable us to improve the way it works. For example, analytics cookies show us which are the most frequently visited pages on the platform, help us record any difficulties you have with the platform, and show us the effectiveness of our campaigns. This allows us to see the overall patterns of usage on the platform, rather than the usage of a single person. We use the information to analyse the platform traffic, but we do not examine this information for individually identifying information. These cookies are set by Optimizely and used for UI development and segmentation purposes. They expire after ten years. See here for more information on the Optimizely cookies: https://www.optimizely.com/opt_out. This cookie is set by Qualaroo for referral information in relation to user surveys. It expires after 5 years. This session cookie is used to allow for cross-login and device use tracking. This session cookie allows decisions about exporting demographic data to Mixpanel. This session cookie allows for analytics integration. This cookie is used for measuring the effectiveness of our campaigns and expires after two years. This cookie is used to determine the initial traffic source (for example, email, or Facebook) of a user for storing what that traffic source was. It expires after 25 years. This cookie will recognise your browser when you come back to the site. 3. How do I manage cookies? Begin your learning journey now! ALL OUR COURSES ARE ACCREDITED! Get exclusive offers and updates! We send out very few emails around 4-6 times a year. We never sell your details. You can unsubscribe at any time.